When Roman Emperor Diocletian retired in the early fourth century after a 20-year reign, he chose to spend the rest of his days near a favorite childhood spot along the Adriatic Sea and built a palace in Split in present-day Croatia. Half palace for his personal use and half military garrison, today this tremendous structure composes the heart of central Split. Chock full of churches, temples, shops, restaurants, byzantine mazes, towers, arches, columns, gates, small courts, and town walls, as well as a variety of buildings from successive eras, the entire complex occupies more than 320,000 square feet and houses about 3,000 residents in its apartments. It’s a fascinating place to stroll around, where the ghosts of toga-clad men and women toting water jugs seem to haunt every one of its mysterious alleys. The view from the top of St. Domnius Cathedral, built in 305, provided an excellent perspective of how sprawling Diocletian’s retirement home really was. But I also wanted to see what this city looked like from afar, a little place to call my own, perhaps without the tourists (two of whom were standing next to me continually calling this place Spilt). 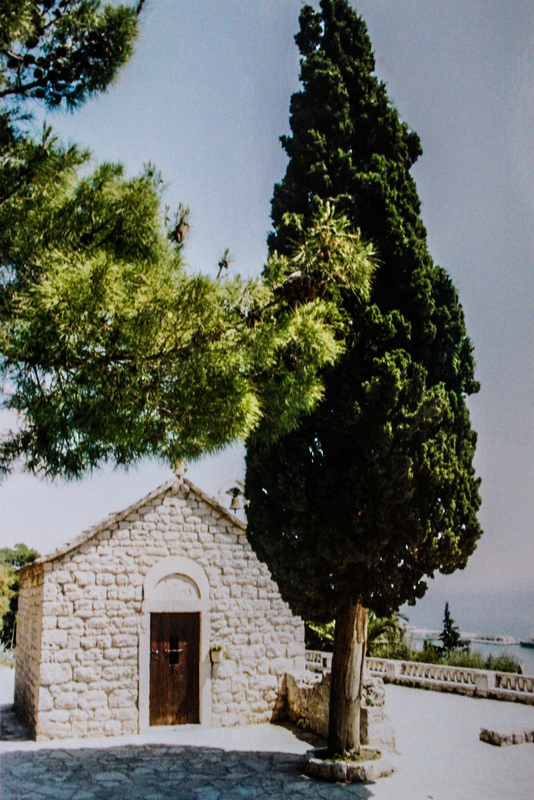 Little St. Nicholas Church has been looking out at Split for more than 800 years. The hunt for such a locale was fairly easy. A 10-minute walk to the west of the palace along the waterfront and Riva promenade, and then a short stroll uphill on staircases and paths, led me to the peaceful residential area of Marjan. Despite the proximity to the major tourist sites, this pine-covered peninsula fringed with beaches within the larger peninsula occupied by all of Split seemed to have retained its local feel. People at the outdoor tables at the restaurant I passed were speaking only Croatian, and the bustle of the city below had evaporated. Near the top of Marjan Hill, I found exactly what I was looking for. The entire city lay spread out before me — Diocletian’s Palace and all the buildings of the ancient city center with their orange and sienna-brown tile rooftops; the palm-tree–lined promenade, abutting the blue water of the harbor as it merges into the Gulf of Kaštela and the Split Channel; modern Split behind it all against the backdrop of the rugged Dinaric Alps in the distance. And not a single tourist in sight. This was the perfect location to rest for a bit and enjoy a tremendous vista that many other visitors to Split apparently had not discovered. I savored the panoramic view, as well as a couple of slices of makovnjaca, a traditional Croatian poppy-seed roll, in the company of just a baby green lizard sunning itself on the wall next to the tiny 13th-century St. Nicholas Church beside me. Crowds in Split are fine, especially at night along the Riva, when locals and travelers blend seamlessly as they gather to listen to live bands and purchase their favorite flavors from ice cream vendors, but when you want a little break from all that, the top of Marjan Hill is the place to go. Noted! I missed this when I was in Split but was there only for a few hours in transit to Sarajevo. It’s worth a return trip!